The three winners of the 2018 Richard H. Driehaus Foundation National Preservation Awards represent different cities and feature varying architectural styles. But they have one thing in common: They’re all standout examples of adaptive reuse. 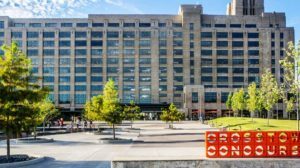 The redevelopers of Crosstown Concourse in Memphis, Tennessee, took an old Sears and turned it into a mixed-use hub with housing, offices, and retail. 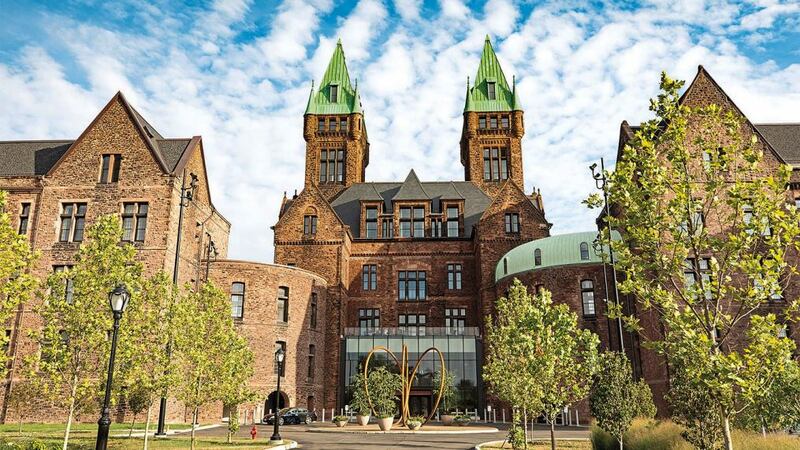 In Buffalo, New York, a former asylum is now an elegant hotel and conference center. And the Page Woodson School in Oklahoma City, Oklahoma has been converted into 60 units of much-needed affordable housing. Each of these projects transformed a beautiful but deteriorating structure into a thriving, dynamic community that positively affects its neighborhood. The awards presentation took place at the National Trust For Historic Preservation’s PastForward Conference in San Francisco, California on November 13–16, 2018. The Driehaus Awards will be presented at the conference’s welcome and reception on the evening of November 14, which will serve as the National Trust’s annual membership meeting for the purpose of electing National Trust board members. A massive Art Deco building just eight blocks from his Midtown Memphis home had long beguiled architect Tony Pellicciotti. The 1.5-million-square-foot former Sears retail store and distribution center opened in 1927. It housed the largest employer in Memphis for decades and served as a vital economic engine for the neighborhood. But as Sears’ fortunes waned, the company first shuttered its retail store and then closed its distribution center in the early 1990s, ending its role sending everything from garden hoses to clothing across the entire Mid-South region. “It was dark and derelict,” says Pellicciotti, a principal in the Memphis office of Looney Ricks Kiss (LRK). “As it died, the surrounding areas died.” The only thing that saved it from demolition was the price tag of knocking down such a sprawling fortress of a building. Today, that scenario would be hard to imagine. 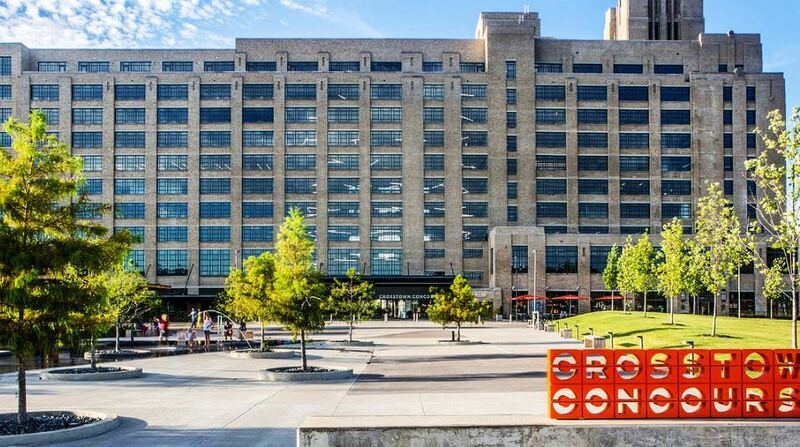 Known as Crosstown Concourse, the onetime Sears outpost is home to hundreds of residents, as well as a diverse mix of commercial and institutional tenants, including an arts auditorium, a charter school, a YMCA, restaurants, nonprofits, and health-care providers. In fact, within the first year of the mixed-use building’s reopening in 2017—almost 90 years to the day after the original Sears held a splashy grand opening—Crosstown Concourse is almost fully occupied. The building’s process of rebirth is as remarkable as its success. Instead of a conventional co-founder, art history professor Todd Richardson, a leader of the Memphis arts organization Crosstown Arts, joined forces with developer McLean Wilson to launch the project. The massive footprint and rundown condition of the structure eliminated the possibility of finding an anchor tenant. Instead, the developers embarked on the long process of building community support. Hundreds of meetings were held to solicit the input of local residents, nonprofits, and businesses. Eventually, eight “founding partners”—including St. Jude Children’s Research Hospital, Crosstown Arts, and Rhodes College—signed lease agreements that helped secure $200 million in financing. Historic tax credits were used, and the National Trust Community Investment Corporation (NTCIC) supplied a New Markets Tax Credit allocation. The Art Deco exteriors were restored, and LRK added seven atria inside to create civic community spaces throughout the huge structure. “The atria are the fundamental programmatic solution in terms of addressing the building size,” Pellicciotti says. “We felt compelled to get natural light throughout to create an environment people want to be in. One of the things we found intriguing is that once the dry goods and shelves were removed, we had a three-football-field-long forest of columns and could see all the way outside the building. We wanted to keep that and preserve it in places, like in the central atrium.” Three of the atria have prominent stairways designed to mimic the distribution center’s original sorting system. Already, ripple effects from the building’s revival are evident. The neighborhood around Crosstown Concourse came together to push for new zoning rules to preserve the area’s historic fabric. Photo of Page Woodson School by Justin Clemons Photography. While working on projects in Oklahoma City’s Central Business District, Ronald Bradshaw, a real estate developer with Colony Partners, would drive around the city’s John F. Kennedy neighborhood east of downtown. “I noticed this school set up on top of the hill and surrounded by 8 acres of vacant land,” he remembers. He first saw it for its redevelopment potential. 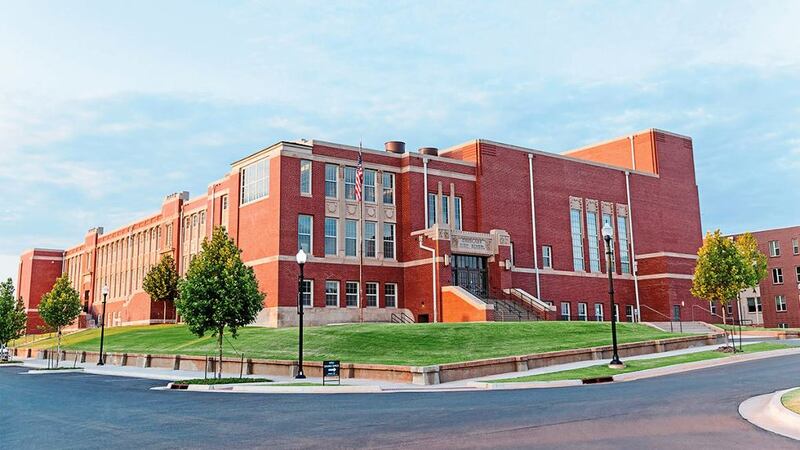 Page Woodson School had been abandoned for more than two decades and was located two blocks from the University of Oklahoma Health Sciences Center, a conglomerate of seven medical colleges with thousands of students but precious little housing. Bradshaw wanted to learn more. A city councilman connected him with several people in the community, including the pastors of local churches. He discovered what many in the city’s African American community had already known: Page Woodson School has a remarkable history. Built in 1910 as the Lowell Elementary School, a school for white students, the Classical Revival building became Douglass High School, the city’s only African American high school, in 1933. Named after author, orator, and abolitionist Frederick Douglass, its alumni include Jimmy Rushing, a lead vocalist for Count Basie’s Orchestra, and jazz and swing guitarist Charlie Christian. 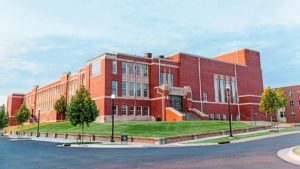 And its 956-seat auditorium was a magnet for visiting African American luminaries, including Duke Ellington and Muhammad Ali. Douglass High School moved to a new location in 1956, and what later became known as Page Woodson School closed in 1993. But it was hardly forgotten. “Most of the [Douglass] graduates who are still alive are in their 80s. But there was a huge emotional attachment to the building in the [wider] African American community in Oklahoma City,” says Bradshaw. Understanding the building’s importance and history was key to reviving it. Bradshaw and his team solicited input from the community and eventually produced plans for a mixed-use development with a revitalized auditorium, office space for local nonprofits, and 60 units of affordable housing in the old school, as well as 68 additional units in a new building next door. Redeveloping the school had its challenges. To qualify for federal historic tax credits, the apartments had to be designed in a way that maintained the original contours of the classrooms and corridors. Bradshaw ended up adding a third story within the auditorium so he could fit enough units to make the project financially viable. The site’s initial transformation was completed in 2017, and the project has already helped spur nearby development. The refurbished auditorium once again hosts performances and other community events. And the offices have been leased to local nonprofits, including the singing group Ambassadors’ Concert Choir and Progress OKC, an organization that works to build affordable housing around the city. Additional phases of the project are in the works, including construction of a plaza that will feature markers describing the history of the school and neighborhood. When Corey Fabian-Borenstein leads tours of the Richardson Olmsted Campus (pictured at top of this page) in Buffalo, New York, she knows to expect visitors from around the world. The 13 sandstone and brick buildings on the 42-acre property were designed by famed architect Henry Hobson Richardson, and its grounds were created by Frederick Law Olmsted and Calvert Vaux. So it’s understandable that people would be willing to travel great distances to get a close look at the campus, originally built as the Buffalo State Asylum for the Insane in 1871. For instance, Fabian-Borenstein has often heard people repeat their belief that patients were kept locked in the main building’s towers. “There has never been anything in the towers. They are just there to be decorative and lovely,” she says. In part, opening the doors to the public is aimed at busting myths about the facility’s history. But it’s also a way to invite support and input for the new history being crafted ever since the campus reopened its three central buildings in April of 2017. A team comprising Flynn Battaglia Architects, Deborah Berke Partners, Goody Clancy, and Andropogon Associates collaborated on the design for the luxurious Hotel Henry Urban Resort Conference Center, which now occupies these structures, including the tower-topped main building. The farm-to-table restaurant 100 Acres is located on the first floor of the same building, and the Lipsey Architecture Center of Buffalo is tucked into the first floor and lower level. The founder of the soon-to-open architecture center was Stanford Lipsey, a former publisher of The Buffalo News who launched an effort to save and repurpose the campus in the early 2000s. Lipsey arrived in Buffalo in the 1980s after Warren Buffett bought the newspaper and asked him to turn it around. The combination of Lipsey’s advocacy and support from the local community resulted in the $100 million redevelopment of the campus, which was funded by $76.5 million from New York state and $17 million in federal and state historic tax credits, as well as philanthropic contributions. The result is a property that is both thriving and looking optimistically toward the future, as the next 10 buildings await ideas for potential development. Featured photo of Richardson Olmsted Campus by Scott Gable Photography. This article by Chris Warren originally appeared on the Saving Places story section of the National Trust For Historic Preservation. Reprinted here with permission.